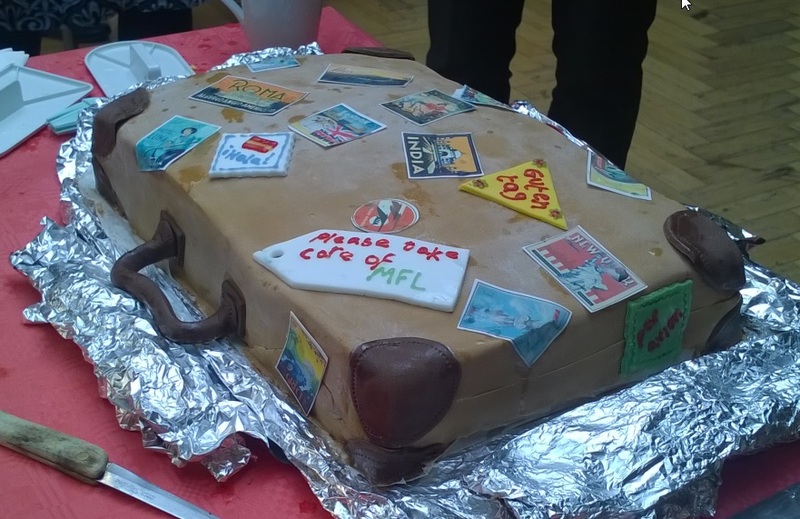 This fantastic ‘suitcase’ cake was made by two teachers Janine Turner and Nancy Ryan as part of a British Bake-off organised for Comic Relief at Altrincham Grammar School for Girls.The idea of the suitcase came from the Head of Spanish, Yolanda Martinez. The label said ‘Please look after MFL’ What a wonderful idea! Our subject does need looking after, I’m sure you will agree. What do you cherish about your own study of languages, literature and culture? What can we do to improve take up at GCSE and A level? Do you think that primary languages being statutory now and the new GCSE and A level specifications will help the situation? In this post I’d like to draw your attention to two important reports. As I mentioned in the last the 13th edition of the Language Trends Survey was launched at the Language World conference in March. If you have time to look at the whole document that is great, but if not the link to the Executive summary 5 (pages 5, 6, 7, 8 and 9 can be found on the last post.) The two authors Kathryn Board and Teresa Tinsley have again worked extremely hard to produce this very thorough study for the language community. It is very detailed research and so helpful to us. They report on their findings on language teaching based on online surveys completed by teachers in representative samples of schools from across the country. Several things struck me as I read through it. They mention new research published in 2014 which adds weight to our argument… ‘the value of speaking more than one language for long-term cognitive function’ by Catherine de Lange in the New Scientist issue 2972. There are many interesting extracts of articles on her website, she has been using Duolingo to learn Portugese. They quote from The Economist too, the findings reported in ‘Gained in translation’ on 17 May. I’ll write more about this next week. Some key things that we should think about. There are still more girls taking at language at GCSE, girls 56% boys 44%. There are two girls to every one boy taking a language at A level. What can be done about the growing trend for schools to exclude pupils from language learning in KS3 and KS4? On p. 109 the idea of an end of KS3 qualification is raised. Should this be considered? What can we do to raise the profile of language learning in Britain? What do you think? The second report just published is the Guardian Living Languages sponsored by the British academy. Martin Williams writes about the seven key findings. You can see a summary and a link to the full report too. More thoughts on these reports and the ideas in them like encouraging people to champion languages next week.